We strive for our camp and club experiences to be fun and magical for all camp participants. Through theater games, singing, and exercises that stretch our voices and our imagination, we have a blast while creating an accepting atmosphere of trust at camp. Our musicals are specifically written so that a 14-year old will feel just as challenged and filled as an 8-year old—although their roles may be quite different. 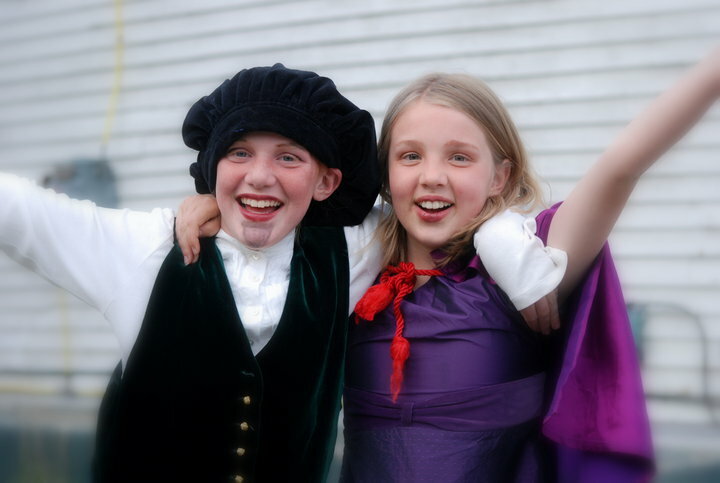 See Casting for the roles children of different ages can expect in our shows. Having worked in youth productions the past seven years, we have seen time and time again the dedication, memorization skills, and acting ability that young students can bring—if given the chance. Here at Inspirations, we allow young people to step up to the roles that we feel they are truly capable of. The campers work very hard to make our end-of-camp performances entertaining and special. It is amazing to see how high these young people can reach--while encouraging each other to soar. Learn more about our Performances, and read some audience Praise of our past shows. Every adult volunteer, visitor, and show attendee lends something to our camp and to our show. At our camp you might see an older student helping a younger one with their lines, a grandfather helping paint a set with a staff member, or a 4-year old being given a backstage tour by her elder sibling. Our camps are a place where we welcome helping hands of all sizes. If you'd like to get involved, check out our volunteer opportunities; and if you have something to offer that is not listed, send us a line letting us know your special gift, and we'll see if we can find a good fit!